You'll be £32.00 closer to your next £10.00 credit when you purchase The History of Toy Soldiers. What's this? Humans have made and collected toy soldiers from time immemorial. They amuse and comfort us, awaken our curiosity, turn aggressiveness into creativity. In The History of Toy Soldiers,Luigi Toiati, himself an avid collector and manufacturer of toy soldiers, conveys and shares the pleasure of collecting and playing with them. 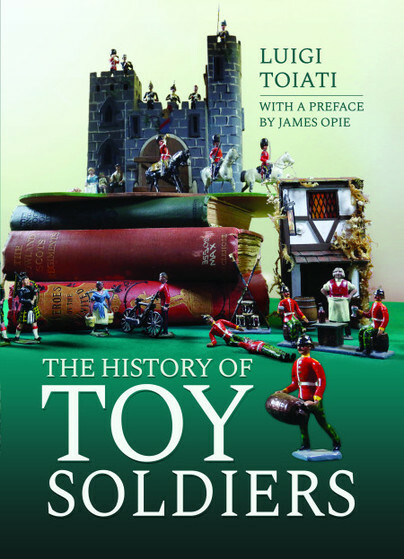 Far from a dry encyclopaedia, it leads the reader through the fascinating evolution of the toy soldier from ancient times to the early twenty-first century. The author, as a sociologist with an interest in semiotics (the study of signs), offers truly original insights into why different types of toy soldiers were born in a given period and country, or why in a given size and material. The author's writing is packed with factual detail about the different types of toy (and model) soldiers and their manufacturers, but also with anecdotes, nostalgia, wit and his enduring passion for the subject. Hundreds of beautiful colour photographs, many depicting the author's own collection, complete this delightful book. Luigi Toiati cannot remember a time before he collected toy soldiers. He has a massive collection but doesn't keep count. He was a professional figure painter for 45 years, starting his career in London, working for his close friend Edward Suren, creator of the famous Willie brand of soldiers. In 1987 he began making his own soldiers, founding Garibaldi & Co. Toy Soldiers. A familiar figure on the toy soldier show circuit, he and his collection have been mentioned in various books on the subject, and he has himself written numerous articles on related matters. He has a degree in Sociology and a deep interest in Semiotics (the study of signs). He now lives in his native Rome with Monica, his wife and co-founder of their marketing research agency, Focus srl www.focusresearch.it).